California Charcoal™ | Official Site | Gets The Ugly Stuff Off With Activated Charcoal! Gets The Ugly Stuff Off With Activated Charcoal! Just peel it away to reveal your deepest clean skin! Do you suffer from blackheads, dirty pores, or oily skin? You've used face washes and squeezed them, but nothing works. Until now! California Charcoal™ is the newest, hottest, at home way to remove blackheads, cleanse pores, and hydrate skin. READ FULL DESCRIPTION Using California Charcoal™ is super easy. Simply apply a thick layer of California Charcoal™ on your face. Let it dry. Then peel it off. 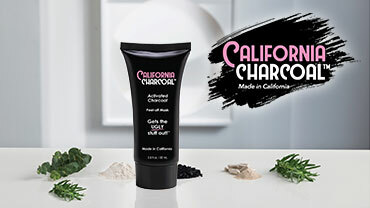 California Charcoal™ has beneficial ingredients that help cleanse and brighten your skin like Activated Charcoal, Clay, Rosemary, and Eucalyptus. California Charcoal™ removes blackheads, hydrates skin, and reduces the size of pores. You're left with a brighter, healthier looking complexion. Once you use California Charcoal™, you'll never worry about blackheads again! One facial can cost hundreds of dollars. Now you can get that spa-like treatment for a fraction of the price in the comfort of your home. California Charcoal™ is cruelty-free, gluten-free, phthalate-free, sulfate-free, GMO-free, and vegan. Buy California Charcoal™- the proof is in the peel! Get California Charcoal™ Charcoal Mask now for only $19.99 plus shipping and handling! That's not all. Double your offer and get a second tube of Black Off™. Just pay a separate $9.99 fee. Gets The Ugly Stuff Out! Using California Charcoal™ Facial Mask Is As Easy As 1,2,3! OFFER: Get your double-sized tube of California Charcoal Activated Charcoal Peel Off Mask for only $19.99 plus $6.99 shipping and handling. Double your offer and receive a SECOND double-sized tube of California Charcoal Activated Charcoal Peel Off Mask. Just pay a separate fee of $9.99. UPGRADE your Deluxe California Charcoal offer. You'll receive a double- sized tube of California Charcoal AND a California Charcoal Moisturizer for only $29.98 plus $6.99 shipping and handling. GUARANTEE: Your satisfaction is 100% guaranteed. If you are dissatisfied with California Charcoal for any reason, simply return the product within 30 days for an easy refund of your purchase price, excluding shipping and handling. See our return policy for more information. Exceptions may apply. Order Above For Smooth, Beautiful, Blackhead-Free Skin! Check out these other great products by California Charcoal™. TEXT FOR OTHER PRODUCT OFFERS. Hear from other California Charcoal™ customers how much they love it, and why you will too! Check out all the news for California Charcoal™ and its creators at TeleBrands featured all over the world.